Are you interested in purchasing the English edition of Lautner A-Z, the new book by Tycho Saariste and Jan-Richard Kikkert? It isn’t available yet but when it is you can buy it from the Foundation. To make sure you are notified when we receive the copies, please complete this simple form. The American architect John Lautner (1911-1994) was well ahead of his time. His original, unconventional and very versatile oeuvre was never repetitive. His concern for the dreams and desires of his clients, his sensitivity to the location of his buildings and his interest in the latest technical developments in were constants in his work. Lautner blurred the boundaries between indoor and outdoor spaces, between nature and architecture.Lautner’s oeuvre spans more than half a century, from his first independent commission in 1939 until his death in 1994. In this time period he carried out 144 of his designs, 103 of which are still standing. Most of them are located in and around Los Angeles. 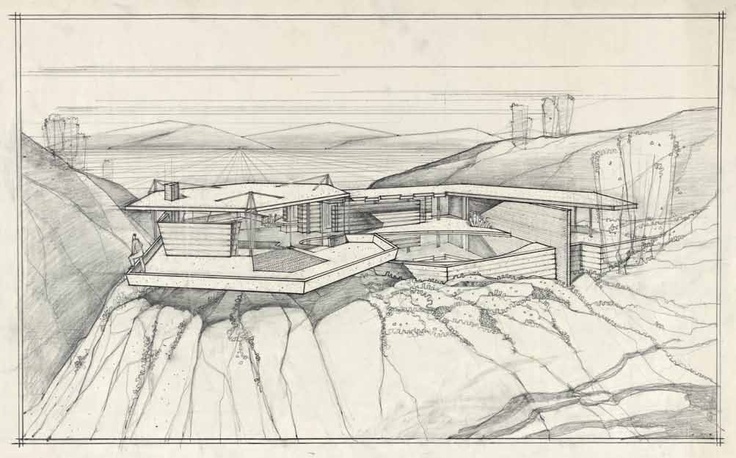 Lautner’s work developed greatly throughout the years: he started off close to his mentor Frank Lloyd Wright and ended with an uninhibited, unique and personal architectural style. This book provides an unprecedented treasury of information about all of Lautner’s built works. It is an odyssey, the story of two architects on a mission: Jan-Richard Kikkert and Tycho Saariste located, visited and described all the surviving buildings. This began with finding the correct addresses through Google Earth and ended with studying dusty rolls of drawings in owners’ attics. Each house visit is described separately, with a focus on striking architectonic elements, the locations and the clients. Kikkert and Saariste also conducted extensive (archival) research on buildings that no longer exist and designs that were never built. The book is richly illustrated, often with photographs made specially for this book. The distinctive Rawlins residence on Balboa Island has been on the market since 2010. The current owner is interested in finding the right buyer. See http://www.realtor.com/news/john-lautner-rawlins-house-balboa-island/ for more information. Follow this link for more photographs. See this page for an aerial view. 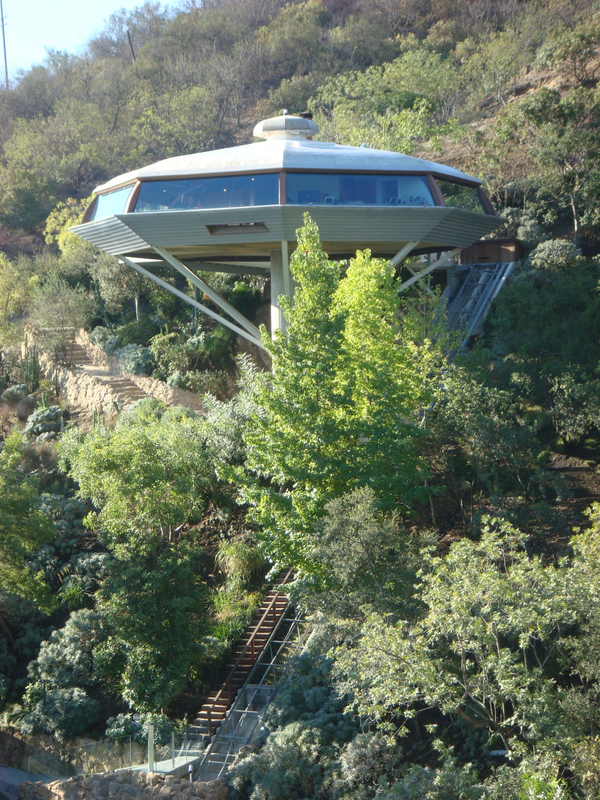 One of John Lautner’s best-known residences is for sale. The Foster Carling residence, built in 1947 (and remodeled by Lautner in 1991) using the same suspended roof scheme as two other Lautner designs (Poling and Jacobsen), also features a wall that opens outward with the flip of a switch, taking the built-in seating from inside the living area to the outside deck. For more information on the house and the sale terms, go to the Modern Living LA website. The site contains several excellent photographs. Curbed LA announced the sale of a residence formerly owned by film director Robert Aldrich, noting that it contains an addition by John Lautner. See the article. In fact, Lautner did three projects for Aldrich, each at a different location. 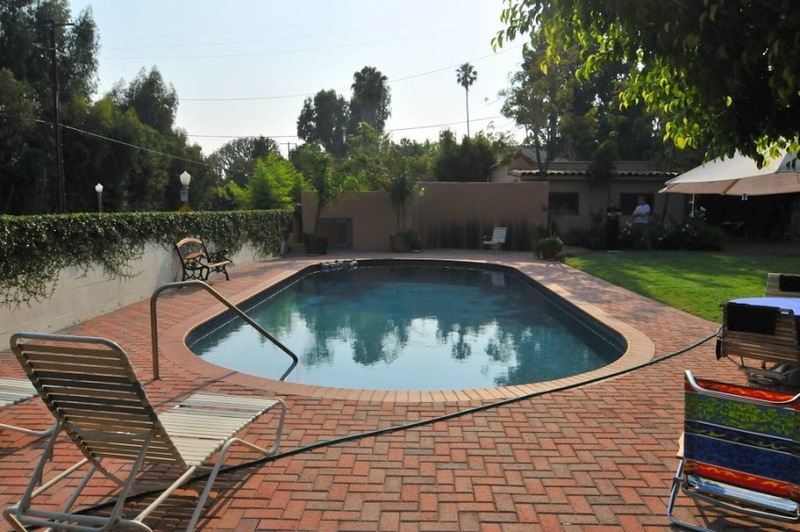 Only the third appears to have been built: a pool and den at the residence currently for sale, completed in 1978. The pool still exists but it is difficult to determine what, if anything, is left of the den addition. The September 6, 2013 edition of LA Times’ Home of the Week features the 1968 Stevens Residence, for sale by noted modernist rescuer Michael LaFetra. In other articles, LaFetra notes that he is expecting a baby in his life and that baby-proofing this home would damage its architectural character. 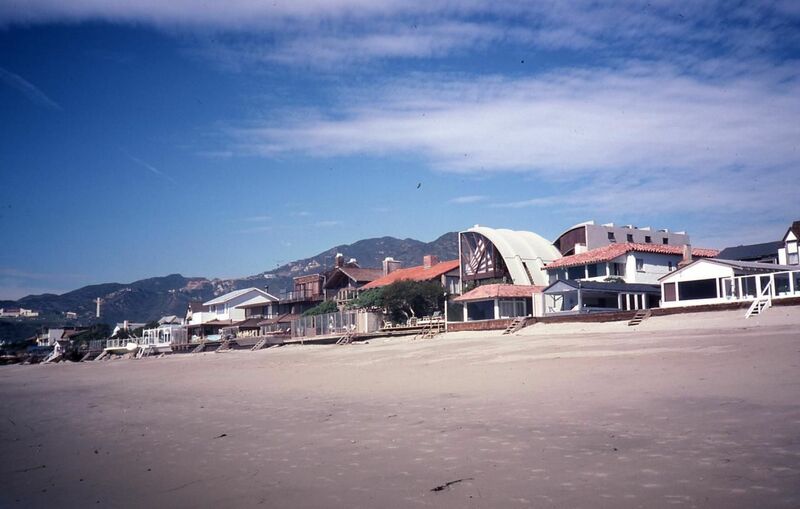 LaFetra spent significant amounts of time and money restoring the elegant beach home to near-original, and enjoyed living there. Even Stevens’ daughter, invited to visit, is delighted with its current condition. The home is more than suitable for a family, as Stevens’ own experience testifies, but yes, it would be tricky for a toddler. We can expect that LaFetra will take care that the next owner is right for it. The September 2013 edition of Grand Designs, a British magazine based on a television show of the same name, lists the Chemosphere (Malin residence) as one of “the most iconic homes of the twentieth century”. The article notes that the six homes chosen in the article have all “played key roles in redefining the benchmark for modern residential architecture”. The chemosphere shares space with Wright’s FallingWater, Le Corbusier’s Villa Savoye,Shigeru Ban’s “paper house”, Gerrit Rietveld’s Schroder house, and Mies van der Rohe’s Farnsworth house. The article, which begins on page 139 of the September issue, features the Chemosphere on the first page. The DeVos Art Museum at Northern Michigan University in Marquette, Michigan, received a number of thank you cards from classes of local school children who visited the museum to see the John Lautner exhibit at the end of last year. Copies of the thank yous are being scanned. In the meantime, Karol Lautner Peterson photographed several in a recent visit. And whenever you are interested in purchasing anything from Amazon, start there! It won’t cost you anything extra but it will benefit the Foundation. A recent addition to our bookstore is an interesting little book on Models of Lautner architecture, by Thomas Demand. As with some other Lautner books, there are few copies left. Act now to get the best price. Thanks to Jan-Richard Kikkert for finding this book. The DVD of Infinite Space is back! Because of increased costs of production, the cost had to go up to $25 (plus shipping). Go to the shop to view details and purchase! Both The Spirit in Architecture: John Lautner and Infinite Space , documentaries on John Lautner’s work, will screen at a theater in Enschede, The Netherlands, on November 27, 2011, at 1:30 p.m. The films will be introduced and discussed by Bette Cohen, director and producer of The Spirit in Architecture, and Jan-Richard Kikkert, Dutch architect who has visited and recorded information on almost every Lautner building in existence, who recently traveled to Marquette, Michigan, to lecture on Lautner.